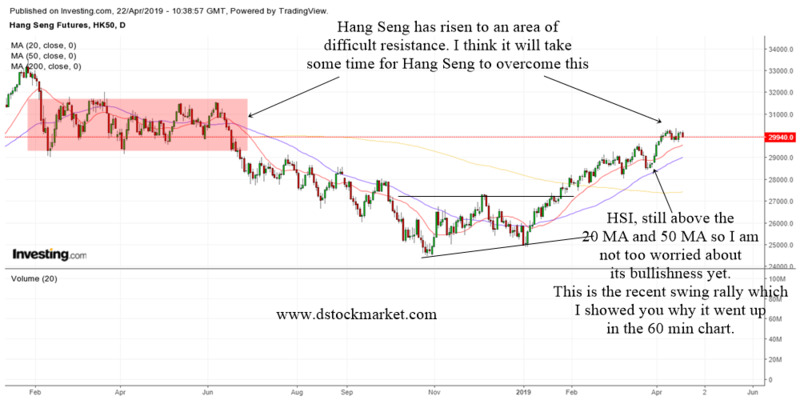 Even before Malaysia's Prime Minister Dato' Seri Najib Razak announced that traders can short Malaysian stocks intraday in the near future, traders could already short Malaysia through America. You could of course use the FKLI to short Malaysia but what happens if the US stock market suddenly collapses during their regular hours. You could only short FKLI during the specified trading hours. By tomorrow, the futures would have gap down. That is why you need to be able to short Malaysia during US trading hours. Here is a little loophole which many Malaysians do not know. The EWM or iShares MSCI Malaysia index fund is an ETF that tracks the performance of a group of Malaysian stocks. It is managed by Blackrock and was founded in 1996. It is one of the oldest surviving ETF in the world. This might sound surprising to many Malaysians. But you actually have to trade this ETF through a US Stock Market broker. The reason is EWM is listed in NYSE. 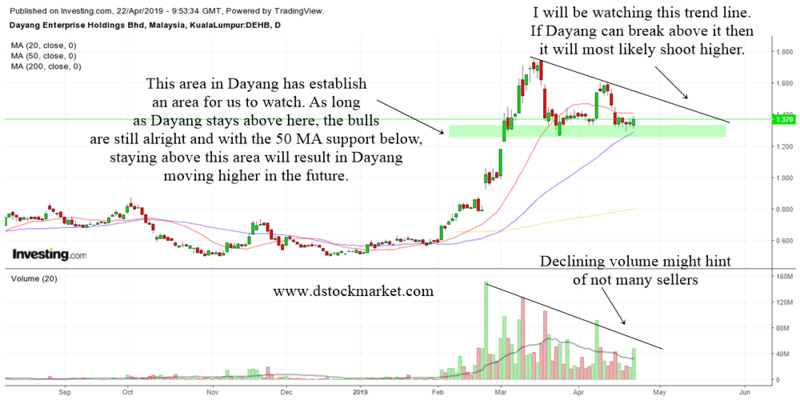 The chart above is the daily chart of EWM. As you can see, the financial plunge in the Dow left no market unscathed. Even Malaysia had a massive plunge when Dow went down. Imagine if you have shorted EWM when Dow plunged. First of all you, could have made some profit shorting EWM. Secondly you could have hedge your positions in Malaysia by shorting the EWM. That way when the stock market opens in Malaysia, the losses in your portfolio is cushioned by the gains from shorting EWM. 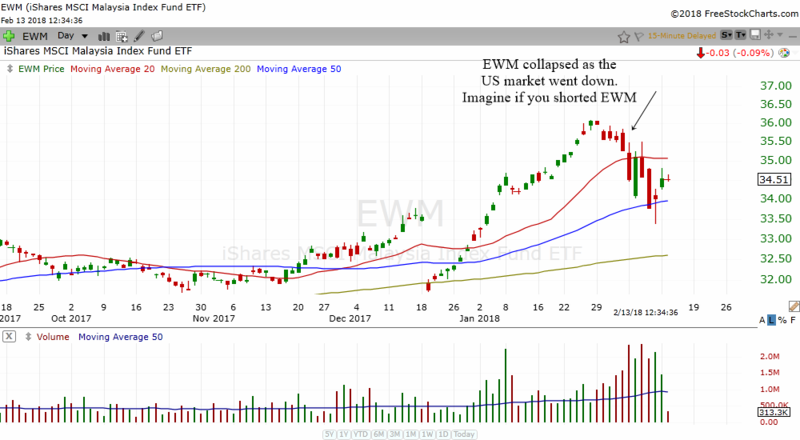 How Do You Buy Or Short EWM? All you need to buy or short EWM is to open a broker that has access to the US market. You can try Interactive Brokers which is my favorite. Because ETF trades like a stock, you can pretty much do anything you want to do with it just as you would a normal stock. Just press the buy button and you will be able to purchase EWM. Or press the sell button and you can short EWM. There is enough liquidity in EWM and the bid ask spread is only 1 cents. There are options on EWM. Yes you can buy call options and put options on EWM. However, the bid ask spread in the options are a bit wide. So if you are a buyer, you might not be in the best position as the bid ask spread for one contract can be as wide as 0.50. Therefore, your best option to play the EWM is still to long or short the shares itself. Since there is enough liquidity in EWM, traders can short or long EWM easily in the short term. The chart above shows the 60 min chart of EWM. You can analyze and trade it just like any other stocks in America. Notice how EWM broke below its 60 min 50 MA and this hinted to a trend change. Even before that, the ETF had a slight gap down below the 20 MA and briefly dropped below the 50 MA. There were 2 bearish setups in the 60 min chart which traders can take advantage to short the EWM. First, you have the 60 min consolidation box breakdown that happen right after the EWM experienced a bearish cross. 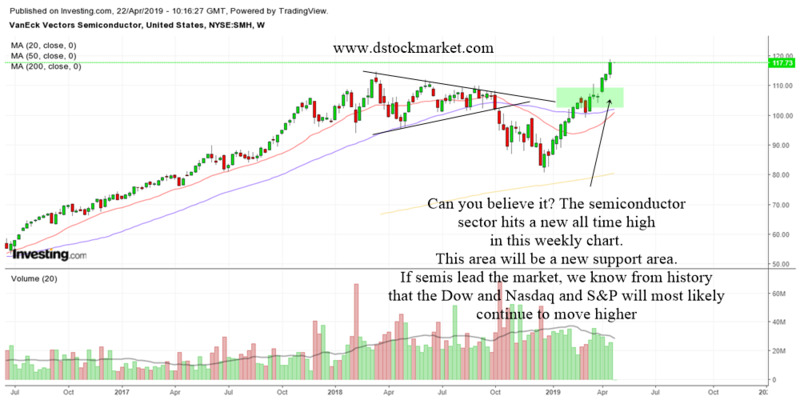 Then when EWM rallied back up to the resistance area, traders could have shorted the etf again. If you would like to learn some short selling trading strategies, hop on to the Trading Strategies page. I still have yet to write all of them out but you will find some short selling trading strategies. Sometimes certain financial instruments will give an early warning of a collapse in a country's index before it happens. 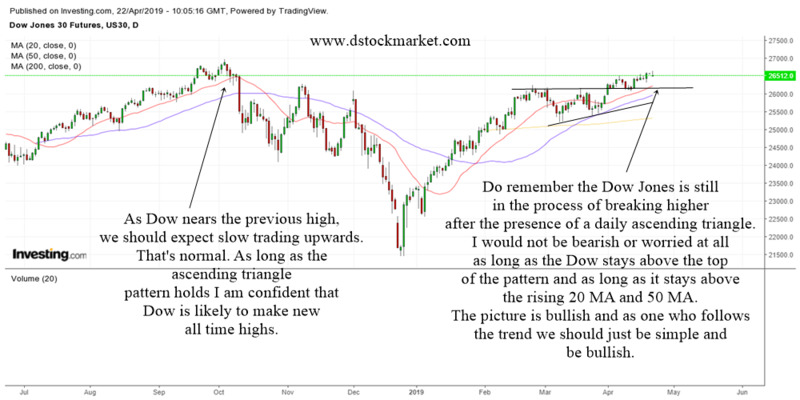 One way is to look at the Dow Jones Industrial Average as it affects all markets in the world. Another way is to look at the country's ETF that is listed in America. They can often give us an early warning of what might happen in the local market. 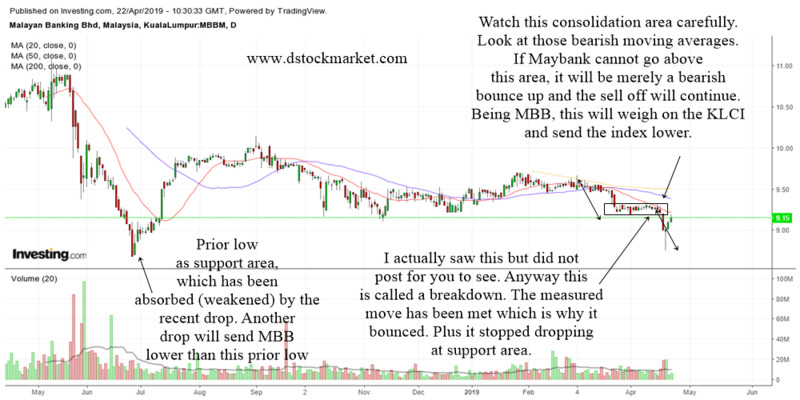 The chart is the 60 min chart of the KLCI. 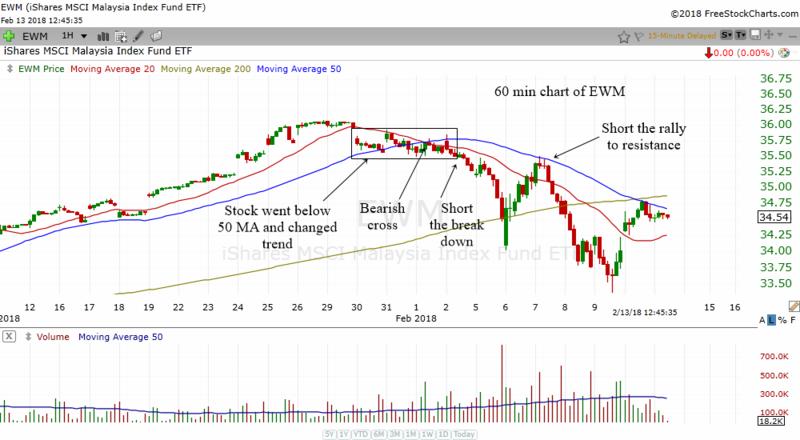 If you compare it with the EWM, you will realize that the EWM topped out a bit earlier than the KLCI. 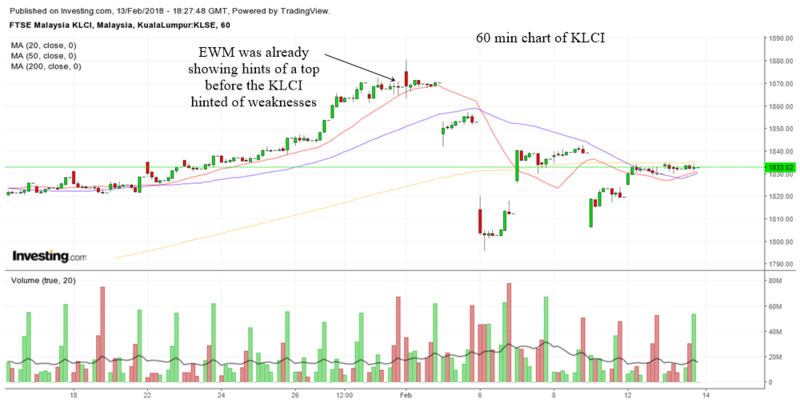 If you have checked the EWM, you would be more prepared for a big gap down in the KLCI. You could have even hedge your positions using the EWM.